Birding in late May starts to take on a new dimension to the fall-filled days of early spring, as the chance of large arrivals of birds decreases, but the hope that the few migrants that make it through will be something special starts to rise. So it was today, where another day of promising easterly winds started quietly, with the only new migrants noted being 2 Garden Warblers, a Great Northern Diver and 2 Greenshank. The usual suspects were still present with Caspian Stonechat racking up another day (just one day short of a month on the island now), female Western Subalpine Warbler at the Obs for an 11th day and the Kumlien’s Gull still present in the South Harbour area. As the morning progressed, things started improving, with the first Icterine Warbler of the year in the Plantation (although it had moved on before the first ringer got there) and a smart male Blue-headed Wagtail in the Wirvie. Another year tick followed soon after, with a Quail singing at Kenaby for a short while during the late morning, then followed a reappearance of the Glossy Ibis; presumably the same bird as was seen earlier in the month and was predicted for a rapid return. The Ibis was first seen heading up the east coast, but then appeared over the airstrip, which was a bonus for those birders waiting to leave the island (and especially for Deryk who, having missed the previous sighting whilst he was crewing on the Good Shepherd, thought he was going to miss this one as well as he was on fire duty for an incoming plane!). In fact, with five flights today to make up for the island being fog bound on Frioday and Saturday, the Glossy Ibis did well to find enough air space to apparently continue its flight north to Shetland! 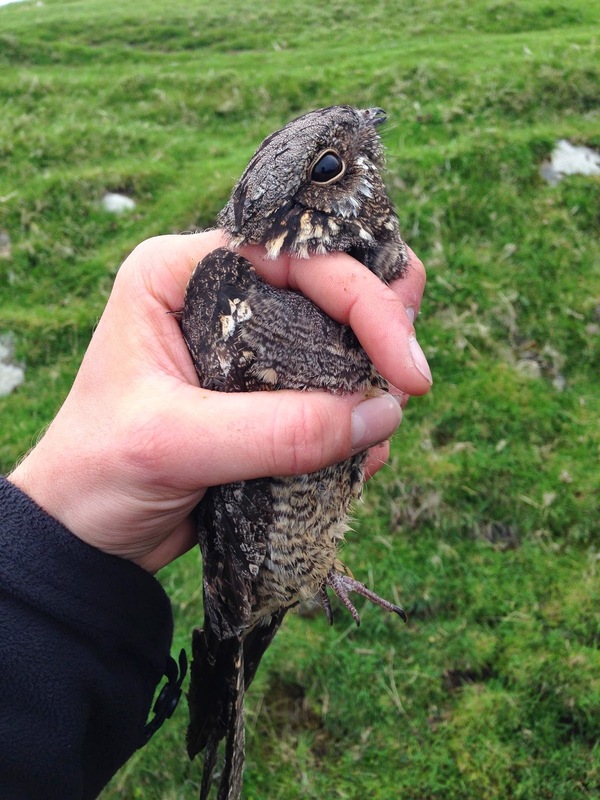 The day’s excitement was far from over though, with a trap round after lunch producing the first bird to be caught in the Helis all day – a Nightjar! Only the 29th Fair Isle record (and just the 8th to be ringed), it was a wonderful opportunity to experience this normally nocturnal goatsucker (it won’t find any goats on Fair Isle and might even be struggling for moths; the trap last night produced just singles of Shears and Marbled Coronet) up close.